A few months ago my team at work did a photography course. The course was supposed to be two Saturdays. I was away for the first session but my colleagues filled me in so that I could do the homework and join the second session. I don’t consider myself great with a camera but I quite enjoy it. This time, I was able to take a (borrowed from work) proper camera out. It’s the first time I’ve shot on manual settings. It was so much fun. And I think some of the pics came out pretty well. The sky is the colour of winter. A little bit hazy; a little bit far away. Like high-school rugby matches from crowded concrete stands. Like long Grahamstown walks past frost-whitened fields. Like quiet days studying for mid-year exams. The air is still warmer, though. Still a sunny Autumn day. Still warm for now. Later there will be a chill in the air. Later the days and the evenings will be colder. It took me many years but I think I’ve learned to love Autumn, just a bit. The leaves are beginning to change. I noticed it yesterday. 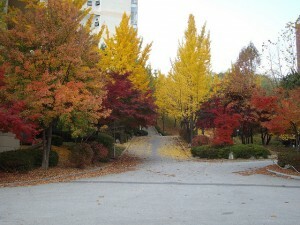 The colours make me think of Daegu, now, and the spectacular Korean Fall. This picture was a trip to visit a friend in Seoul. Joburg never quite matches that but Zoo Lake and Emmarentia Dam are pretty and the Joburg flowers add their little bit – purples and reds, from bougainvillea to bottlebrush to the sweet scent of the last few yesterday-today-and-tomorrows. The mornings have a chilly edge, too, and there is a glare in the air that wasn’t there during the sunny months. The sun slips and slides through the Jacaranda trees as I walk to the station in the morning. Some days I stop for coffee and just enjoy the depth of the sky and brightness. Today I sit on my pleasantly warm balcony thinking about Autumns past, as a quiet weekend gently drifts away. It felt good to wear my boots again; to slip into jeans and boots and a loose T-shirt and set off with my camera and my bag. Of course there have been plenty of other places in between but I haven’t set off on a local adventure, an adventure close to home, like this in a long time. It’s how I used to adventure in Korea. The familiar anticipation of discovery coupled with the joy of being outside and walking and being alone. Which is not to say, at all, that I do not enjoy exploring with others, but this is how I first learned to travel alone. Today wasn’t a complicated adventure. I finally decided to buy a new camera. I’ve been using my cell-phone recently but using a cell-phone as a camera runs down the battery and is rather inconvenient. So I picked up a new camera this weekend. It’s nothing fancy – just the sort of basic camera I like, but I thought I’d better get in a little practice. 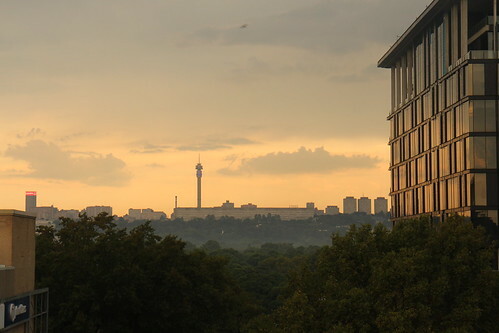 I’ve also been meaning to do some exploring in Joburg. I have a super-convenient set-up – living within a few minutes of the shops, from where I catch a train to within 5 minutes of work. It’s great, but it means it’s very easy never to leave this comfort zone. And that doesn’t make for very good stories. So, on Sunday morning, I put on jeans and boots and packed up my camera and set off to the Joburg Zoo. I’d been torn, initially, about whether to go to the Joburg Zoo or the Pretoria Zoo (So much choice!). Pretoria has the added draw-card of possibly, maybe, seeing okapi but there were other things that needed to be done during the day, so the shorter trip to the Joburg Zoo won the day. It is a short trip – around 15 minutes. I got the bus from the Rosebank Gautrain station at about 10:15. The route goes through Parktown North and then towards Emmerentia and around Zoo Lake. 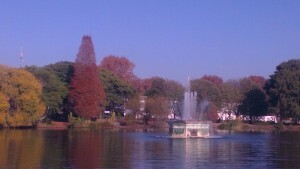 As we rounded the lake, I saw the fountains and people walking around the lake and it looked so much like Suseong Mot (Lake) in Daegu, Korea, that I nearly got off the bus at the next stop and gave up the Zoo entirely. I decided not to, at the last minute, deciding instead to try and visit the lake next weekend. The leaves have begun to change and there is little as lovely as wandering gently around a pretty lake surrounded by autumn trees. Next stop: the Zoo. The bus stop is on Upper Park Drive, near the main entrance. I joined the queue, wryly aware that everyone else was buying tickets for family groups (“two adults and a baby”) or couples. I didn’t care. Ticket in hand, I went in. Some tourist attractions are well sign-posted. This one was confusing from the start. I bought a map, which helped some, although it was also a little confusing. On a related side-note, what is it that makes the makers of tourist maps assume that people can’t read proper, at-least-vaguely to scale maps, so that they feel compelled to create not to scale pictures that, while pretty and interesting are not actually very helpful? Not that I should really complain – it doesn’t seem to stop me finding my way around fun places like this. I started with a bored looking gorilla, some lively monkeys and a Howitzer. The Joburg Zoo, as well as backing onto the SA Military History Museum, includes a few moments, one of which is this Howitzer, commemorating the men of the South African Heavy Artillery who fell in the Great War. Near the canon was one of my favourite spots, the meerkat enclosure. These adorable, if rather unpleasant-smelling creatures may have been the cutest of the day. Although they would have to compete with a red panda who just about turned itself inside out trying to climb down from a tree and a decidedly inquisitive ratel (on the other side of glass – or would’ve been less enchanting). The Joburg Zoo has a wide range of animals. Some are fairly predictable, especially the big draw-cards like the lions, the rhinos, the hippos and the elephants. 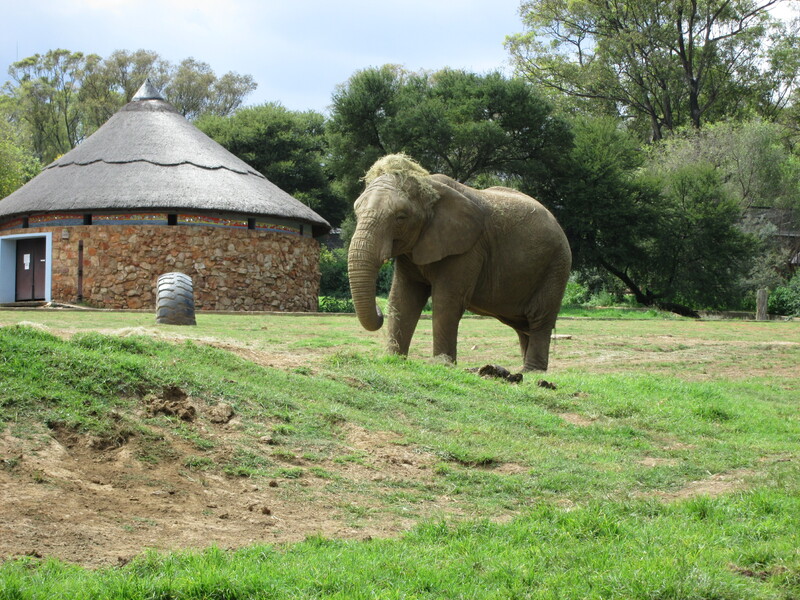 Although I imagine most visitors don’t expect to see the female elephant with her lunch on her head – yes, really. But there are so many others. From the scimitar-horned oryx and waterbuck to yellow- cheeked gibbons and the laziest of chimps. The yellow-cheeked gibbon pair had a young one, who – delightfully – kept racing along the fence to look at the people before rushing back to his mother. The other gibbon family, white-handed gibbons I think, also had a couple of young ones, one of whom was obliging enough to do that silly gibbon walk. There were also polar bears and brown bears and chimps and cheetahs and zebras and a camel. But I think my favourite part may have been the birds. There are so very many birds. The wetlands area is home to flamingos and pelicans and so many ducks. Wild loeries and crows and hadedahs add their voices from the trees. Throughout, every pond was populated by beautiful waterbirds. The zoo also has two walk-through aviaries, one which was the quietest, most peaceful part of the day. The trouble with places like zoos, for me, is that they tend to be popular with families with young children, with whom I do not particularly enjoy sharing space and time. The birds, however, hold none of the fascination for small people that elephants and lions do. The second aviary, the Sasol Wing, is home to a range of birds, from parrots and cockatoos, to hornbills, swans, vultures and eagles. I stumbled upon it (again with the poor map) and found myself wandering around the edge, looking into every enclosure and really just enjoying the quiet beauty of birds. This was before I even realised it was possible to go inside. I’m glad I took the time – what a lovely part of the day. There was another ubiquitous member of zoo life who I’m pretty sure wasn’t there on purpose – squirrels. I didn’t know there were squirrels in Joburg. I always think of them as belonging to the Western Cape. So, I was taken a little bit by surprise when I noticed movement in the grass at the edge of the Nyala enclosure and a squirrel sat up and started eating a nut. I’d not be surprised if they knew there were intruders, too – I swear I saw another, later, trying very hard to pretend it was a duck. On my way out, I met some black spider monkeys, some ring-tailed coatis and a last few owls, before making my way back to the bus-stop. I know there are people who feel that zoos are cruel just on principle. I don’t agree with them, partly because I’ve met the reality of a creature like the okapi’s natural habitat and recognise that some species will never survive without zoos, partly because of the educational value and partly because I think it is important for humans to be able to spend time around great and tiny beasts. Joburg Zoo has a pretty good selections, but it’s also clear that how well-maintained a specific area is and now well-developed the programme around that animal, depends on the whim of the donors in question, which is not an ideal way to be. I’d like to see them make more effort to keep the whole place up to scratch, from taking a little more care to maintain the polar-bear enclosure to ensuring that the glass windows through which visitors view the animals are clean. In spite of this, it was a great opportunity to enjoy the animals, to try out the new camera, and just to spend a few hours wandering along tree-lined avenues between ponds and streams and the open-spaces of large animal enclosures. Joburg Zoo website: www.jhbzoo.org.za Entrance: R61 per adult. Bus trip: R20 each way.